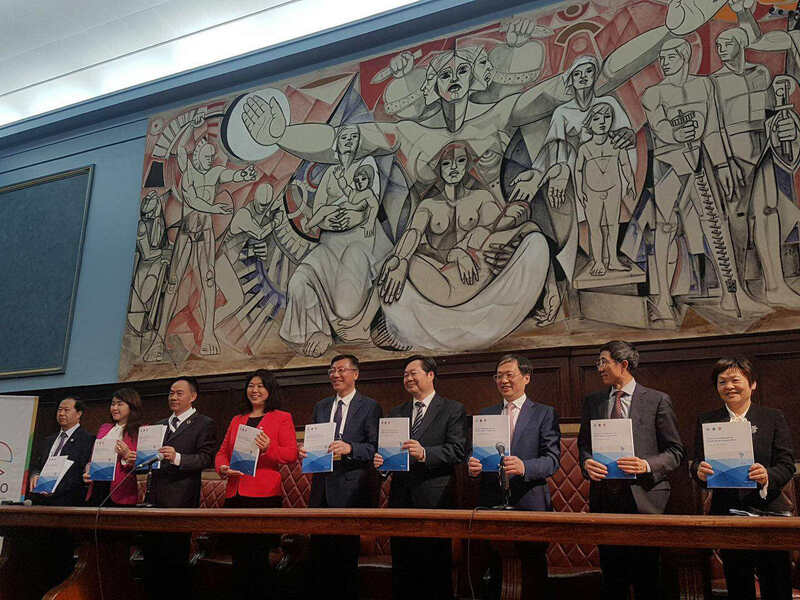 Under the framework of the Second High-level UN Conference on South-South Cooperation “BAPA+40” conference, was successfully held the South-South Cooperation in a Digital Era side-event on March 19, 2019, in Buenos Aires, Argentina. At the event, the President of Uruguay, Mr. Tabaré Vázquez, Mr. Cai E’Sheng, Chairman of the Finance Center for South-South Cooperation (FCSSC) and Mr. Jorge Chediek, UNOSSC Director and Envoy of the Secretary-General on South-South Cooperation, delivered a keynote speech. The Finance Centre for South-South Cooperation (FCSSC) in partnership with the United Nations Office for South-South Cooperation (UNOSSC) held this side-event which aimed to highlight the impact of digital technology on South-South cooperation, analyzing its opportunities and challenges, and how to make full use of digital technologies to realize more prosperous, sustainable and inclusive development towards the attainment of the 2030 Agenda for Sustainable Development. During the event, was launched a prototype of a global knowledge sharing and partnership brokering platform entitled “South-South Galaxy” that will be able to respond more systematically and effectively in supporting Southern countries’ demand to connect, learn and collaborate with potential partners digitally. Furthermore, it was introduced the new South-South Cooperation Annual Report titled “South-South Cooperation in a Digital World”, a joint report by FCSSC and UNOSSC which analyzes digital opportunities and challenges in the context of South-South cooperation, exploring proposals for digital industrial cooperation among Southern countries, including trade, regulations, capacity building and financial infrastructure. The event counted with remarkable high-level speakers and audience. The President of Uruguay, Mr. Tabaré Vázquez, Mr. Cai E’Sheng, Chairman of the Finance Center for South-South Cooperation (FCSSC) and Mr. Jorge Chediek, UNOSSC Director and Envoy of the Secretary-General on South-South Cooperation, delivered a keynote speech, followed by Mr. Tianyun Hong, Vice Minister of China State Council Leading Group for Poverty Reduction, Mr. Slamet Soedarsono, Deputy Minister for Political Affairs, Law, Defense, and Security, Ministry of National Development Planning of Indonesia, and Mr. Jens Frølich Holte, State Secretary for the Ministry of Foreign Affairs of Norway. Copyright © 2015 Finance Center for South-South Cooperation. All Rights Reserved.